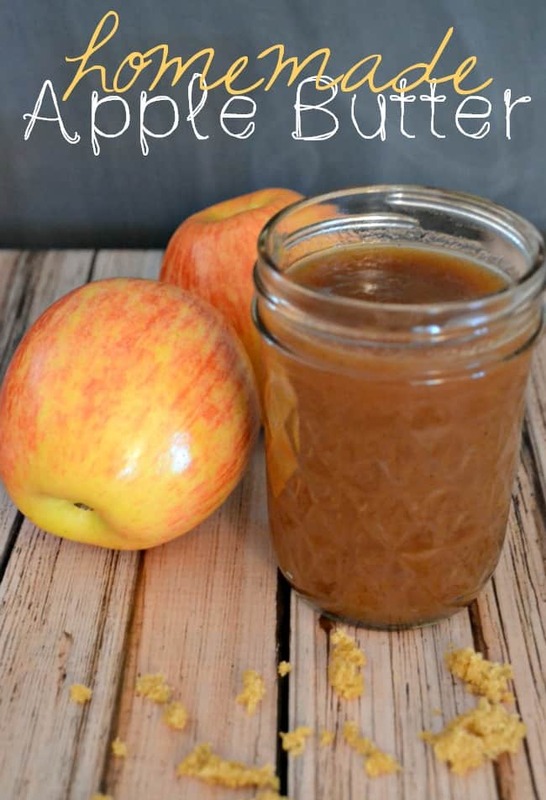 If you are looking for an easy Homemade Apple Butter recipe then look no further. This simple recipe is made in a crockpot and requires only a few minutes of prep time. Taste just like fall in a jar! I am lucky enough to live pretty close to where I can pick up some of the best homemade apple butter, made by the Amish, without having to spend time in the kitchen prepping for an all day cook-a-thon. However, I would be missing one delicious thing, and that would be the smell of it cooking. The scent of apples are my favorite, to begin with so mixing apples with cinnamon and brown sugar and all that yumminess is heavenly. It’s like a big ole pot of fall. 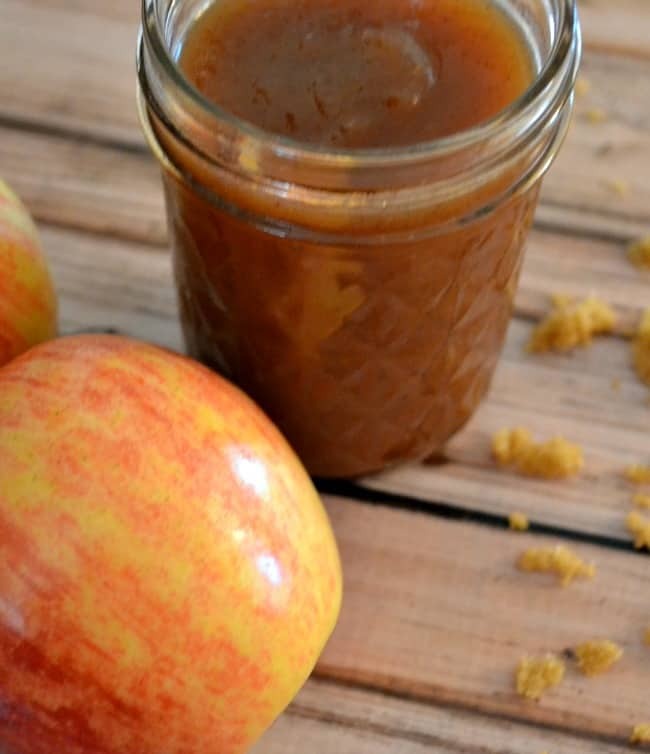 If you haven’t made homemade apple butter then what are you waiting for? Get in the kitchen but don’t forget your apple peeler and corer. Combine all ingredients in your slow cooker and let cook for 8-10 hours on low. Puree the mixture with an immersion blender or regular blender until smooth. Transfer the apple butter into mason jars or an airtight container. It is good in the fridge for approximately 2 weeks. This apple butter is so delicious and great on all sorts of things from biscuits and toast to pancakes and waffles. I made it in my slow cooker and it turned out the best yet. If you are looking for a slow cooker upgrade or don’t own one of your own already you should definitely check out the Hamilton Beach Set & Forget Programmable Slow Cooker. It works great! I love that it has a locking lid so that I can just take the whole slow cooker on the go. That is perfect for parties or game nights. I absolutely love apple butter. I am definitely adding this to my to-do list!! That looks delicious. I’d love to spread that on some homemade, warm cornbread. I like chili in the fall. I have more than one favorite fall crock pot recipe but I think this one could be a new fave. 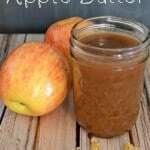 I haven’t had apple butter in a few years and I would love homemade instead of store bought. My mom used to make apple butter. I have not had it in years. I may have to make this. I grew up in the south, so I’m all about apple butter. It’s so good on biscuits. There’s nothing like homemade apple butter in the fall! I’ll definitely be pulling out my crock-pot for this recipe! I have that exact slow cooker and love it! We have at least 2 or 3 meals from the slow cooker every week. I have not tried Apple Butter before. It sounds pretty simple to make. I love doing a roast and veggies in my slow cooker. Oooh, I love apple butter! I’ve never made it myself, but will definitely have to give this a try. I love apple butter! Thanks for the recipe! I just saved this for later! I love apple butter and I have an abundance of apples right now. I have never made apple butter. But it looks easy and delicious!! I’m a HUGE fan of apple butter! Usually we make it in the oven on a really low heat over night. I will have to try this method! Crockpot apple butter is just amazing. And the smells in your house are fabulous! Yum, I LOVE apple butter! I had no idea you could make it in a crock pot though, how cool! I have never heard of Apple butter. This sounds delicious though! I have yet to try apple butter. I think I’d like it though and I bet it makes the house smell amazing while it’s cooking. I don’t think I’ve ever tried apple butter, but I bet it tastes great. If you like apple sauce (esp cinnamon and more of a spicy kind) then you would love it. I have been thinking about making my own homemade apple butter. This sounds super simple to do in the crockpot. I bet your house smells amazing while it is cooking! I’ve always wanted to try apple butter! I love making apple crisp in the slow cooker! Sooo good! I love making apple butter, apple sauce and apple juice this time of year. My husbands aunt lives on the old family farm and they have an apple orchard. Last year we had crates of apples and I got really creative with freezing and canning. Apple butter in the slow cooker?!? I had no idea you could do that! I have not tried to make my own apple butter. I love making stews in my crock pot. I’ve never made anything like this on my own at home. What a great idea and way healthy! Ha! You have my same slow cooker! So I guess that means I can definitely make this! EEK! I just got the same slow cooker and I am IN LOVE!!!! I just used the probe function with a pot roast just last night. I’ve never made apple butter in the slow cooker, but I will surely try! I’m pretty sure I can smell that now! So much YUM! You’re dead on, it makes the whole house smell like Fall. That’s a really nice one! I love apple butter. I used to always have it on toast with my breakfast. This apple butter looks so delicious! I have had my eye on that slow cooker. I want to get it! My m-i-l cans and she just gave me 3 jars of apple butter… my husband loves it! And… I want that slow cooker! 3 jars wouldn’t last long in our house. lol I’m really in love with this slow cooker. It has all the bells and whistles and for under $60. Oh my goodness does that sound delightful. I’ve never made it myself, but you sure make it seem easy. I’m gonna do it. Oh I really love apple butter. I’m going to try this recipe this weekend! This makes a huge batch. I’m just concerned that it only keeps for two weeks. If i made the whole batch will it not keep in sealed jars for the winter? Can you bottle/preserve this recipe? Looks so good! Can I can this apple butter? How many 8 oz mason jars can I get out of one batch?